Russian President Vladimir Putin speaking at the BRICS summit in Beijing. 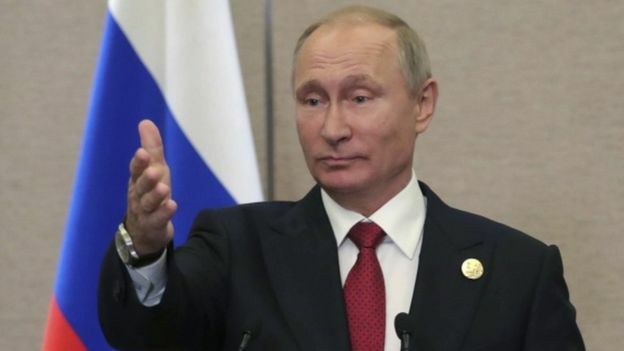 Russian President Vladimir Putin has said pursuing further sanctions against North Korea is “useless” saying “they’d rather eat grass than give up their nuclear programme”. Putin also said that the ramping up of “military hysteria” could lead to global catastrophe. China the North’s main ally has also called for a return to negotiations. Although he condemned the North’s test as “provocative”, Putin said: “Sanctions of any kind would now be useless and ineffective. German Chancellor Angela Merkel backed that stance on Tuesday, saying more sanctions were urgently needed to counter the North’s “flagrant breach of international conventions”. Haley did not spell out what additional measures might be taken, but diplomats have suggested an oil embargo would have a crippling effect. There could also be a ban on the North’s national airline, curbs on North Koreans working abroad, and asset freezes and travel bans on officials. On Tuesday, South Korean Foreign Minister Kang Kyung-wha said after a conversation with her Chinese counterpart that she believed Beijing “could be open to more sanctions”. After telling the UN Security Council that North Korean leader Kim Jong-un was “begging for war”, Nikki Haley said: “War is never something the United States wants. In talks overnight, US President Donald Trump and South Korea’s Moon Jae-in agreed in principle to scrap a warhead weight limit on the South’s missiles, which are currently capped at 500kg (1,100lb), giving it a greater strike force against North Korea. South Korea’s Asia Business Daily quoted sources on Tuesday as saying the North had been observed moving a rocket towards its west coast. He said that given the North’s range of weaponry, including long-range artillery, simply setting up missile defence systems made no sense. Putin’s comments underline the closeness of the positions of Russia and China on the North Korean crisis, making a further punitive sanctions resolution from the UN Security Council unlikely. Moscow and Beijing are pushing for a diplomatic opening but their “roadmap” has been rejected by Washington and it is far from clear what the Pyongyang regime’s attitude is to potential talks. Putin’s comments also reflect Russia’s own position as the target of US and EU economic sanctions, imposed in the wake of its seizure of the Crimea and its wider behaviour in eastern Ukraine. Map showing North Korea’s nuclear tests to-date. BBC picture. 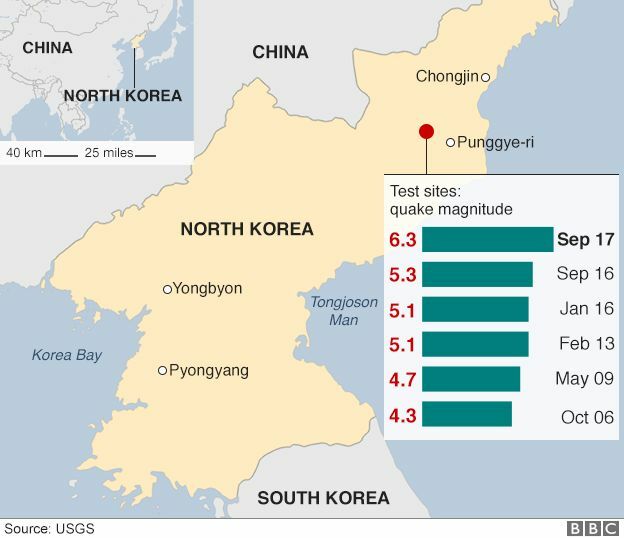 It was North Korea’s sixth nuclear test to date. But analysts have said the North’s claims about miniaturisation should be treated with considerable caution.